The famed Broadway show so vividly brought to life on screen and equally celebrated with 10 Academy Awards, mondo box office bucks and full pop culture infusion arrives on Blu-ray with bells and whistles, as well as a robust high definition transfer. For the most part it’s still a marvel and a strangely vacant tragic love story. Of course, the original source material is Romeo and Juliet reset in the streets of New York. Although here, with its bubble gum musical treatment, the environment feels significantly less gritty and less threatening than Shakespeare’s 17th century Verona. But more on that later. The opening scene is still electrifying. After the overture and the calm helicopter view across the city, the film settles in on an enclave of one of the boroughs, a school yard where a gang of 'thugs' snap their fingers in unison. It’s part of their intimidation of the other kids around them to assert their authority. There’s no dialogue and little music. 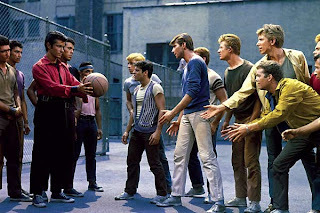 Then, as the guys strut down the street, a glide of the foot, a ballet leap and a twirl signals a full-on dance number, during which we’re introduced to the Jets and the Sharks, two rival gangs, one made up of Polish descendants and the other Puerto Rican immigrants. Jerome Robbin’s innovative and startling dance numbers combined with the energetic direction from Robert Wise results is a superlative introduction to the film. The first third of the film, in fact, is one eye-popping scene after another. In the tradition of the best studio musicals of the ‘30s, Wise’s camera whips around freely and moves as elegantly as the dancers. And when punctuated by Leonard Bernstein’s punchy score, everything is perfectly in sync. Where the picture suffers is the love story between Maria (Wood) and Tony (Beymer). Wood, as a Puerto Rican, still distracts us from her star-crossed infatuation with Tony. And Richard Beymer is unfortunately upstaged by both Russ Tamblyn and George Chakiris. Tamblyn and Chakiris are so prominent in the first half of the film that we actually forget it’s about the lovers. As leaders of their clans, they both express themselves with wildly different but equally mesmerizing dance styles. The ‘Dance at the Gym’ sequence is one of the most impressive numbers showcasing both dancers at their best. Chakiris features a tightly wound and controlled Latin-America style while Tamblyn shows off his acrobatic ‘Donald O’Connor’ flips and jumps. The terrific Blu-ray featurettes consist of numerous acclaimed choreographers and dancers breaking down the innovations from Robbins in these sequences for lay viewers like myself. The film loses much of its energy with the deaths of Tamblyn and Chakiris after their second act rumble. With them out of the picture, we can only rely on the love story to maintain the momentum. Sadly, the romance falls flat all the way to the end. Robbins and company do manage to pull out one great sequence in the second half, perhaps the greatest musical number in Hollywood history. The ‘Cool’ number, which takes place in the dark and claustrophobic parking garage, was famously reworked by Martin Scorsese in his Michael Jackson ‘Bad’ video. There’s no Chakiris or Tamblyn in this scene, but the rest of Jets kick it up a notch with style. Even though this is the small screen, we can feel the sense of scope from the original 70mm cinematography. The wide shots look bigger, the colours pop brighter and the close-ups are more pristine and detailed than most pictures of its time (or now!). None of this grandiloquence is lost over the years. And although the love story doesn’t work, the doomed finale feels utterly tragic. It’s a strangely downbeat ending to a monumentally successful film. 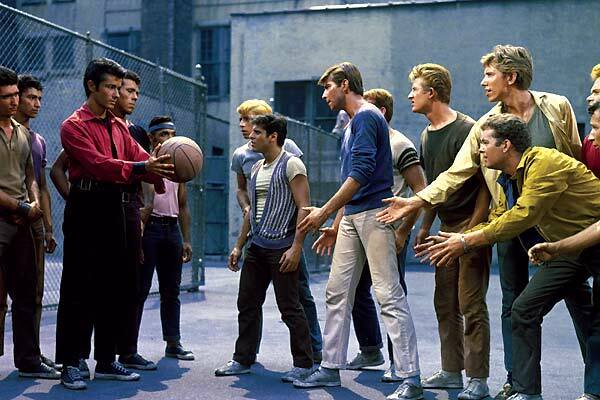 West Side Story is available on Blu-ray from MGM/20th Century Fox Home Entertainment.